Effective workplace communication, how do you know? When you want to have an effective workplace communication you need to measure the communication. 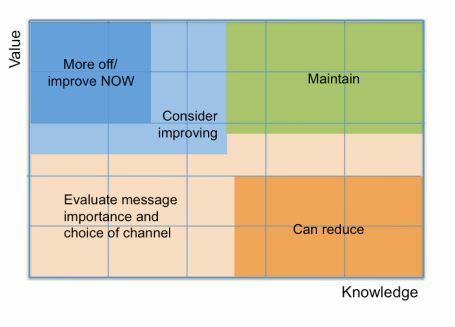 The channel matrix and the message matrix are quantitative research that you can use when you want to measure the effectiveness of your communication. Why would you want to do that? Well, most companies don’t. They rather communicate as they always done. But if you don’t know if it is effective you might be spending your energy and money to waste. So, if you decided to measure your communication I will give you a very good method of doing this. This is a survey that you use either as a stand-alone survey or you add it to your regular employee survey. A bit of warning though, most companies tend to measure their internal audiences on a bi-yearly basis or even less frequent, so you might want to drive this your self. What this survey will give you is a basis for an analysis where you can see a clear picture of what channels and messages are working best for your employees and what you need to do to have an effective workplace communication. And you can perform the survey either electronically (which is preferred) or the old fashion snail-mail-way. So the basis is just a few questions that can be presented in a matrix. 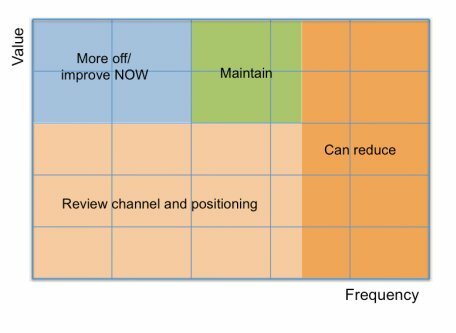 When it comes to the channels, you start with listing the most common communication channels that you have in your organisation. Select both general company channels and specific local channels. In my example I have listed a number of channels that most companies have, but you don’t have to use the same list, of course. Choose the once that are applicable for you. There are basically two questions that you need to have answered for every channel. 1. How important is it, and 2. How often do you get it? For each question there is a 5-degree scale as shown in this illustration. Gather all the data and analyse it. For each channel you want to find the average value on both questions, and then you plot the channels in to a channel matrix as shown in this illustration. In the same way you ask question regarding the messages that are sent in the channels. The messages indicate what you or your organisation communicates to your employees and is very important to measure. By measuring both the channels and the messages you have an opportunity to take control of a large part of the communication. The rest is timing, need, culture and other factors that we will cover later. When measuring the messages you want to list all the types of messages that are sent in your channels. I have listed a number of generic messages in my example. Try not to be to specific, because then you have to make a very long list. Instead, try to group your messages in types of messages, just as I have done. The two questions that you want answered are: 1. How important is the message for you, in your work, and 2. How well informed are you? Go about gathering the data in the same way as you did with the channels and calculate the average values for each message and question. 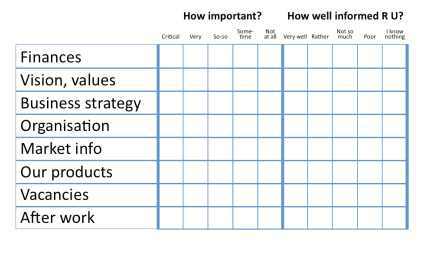 Plot the messages into the message matrix for analysis of how effective workplace communication you have. What you have now is a foundation for you analysis. The optimal way to have a really good basis for effective workplace communication would be if you also made some interviews to get some background information for the channels and the messages. The two matrix's that you now have should be used together with common sense. After all it is just statistics. What do you think about the outcome? Does it make sense? How can you use the material? Take a step back and look at the numbers with a perspective of someone who is a message owner. Good luck. 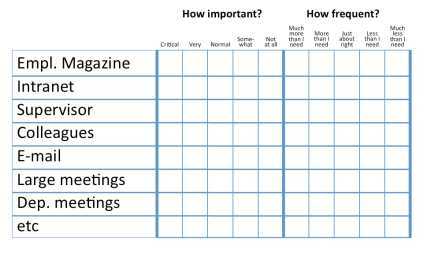 Was this model useful to get effective workplace communication? Give me feedback. Let me know what you think. Click here.